When Dr. Goodall started her study of chimpanzees in 1960, very little was known about their behaviour in the wild. Since then, studies analysing almost every aspect of chimpanzees’ multifaceted behaviour have sprung up across Africa. In the years since Dr. Goodall began, scientists have reaped a bounty of data from chimpanzee study sites, yielding new insights not only into chimpanzee culture, but into our own culture as well. Although wild chimpanzees are only found in Africa, most people are aware of what they look like from zoos, photos and films. Chimpanzees have black hair and pinkish to black bare skin on their faces (except for hairs on the chin), ears, palms of their hands, and soles of their feet. Infants have very pale skin in these areas and a white tail tuft, which disappears by early adulthood. Chimpanzees walk on all fours, or "quadrupedally," on the ground and in the trees. As they use their knuckles for support they are sometimes referred to as "knuckle-walkers." This form of locomotion means chimpanzees have evolved to have longer arms than legs. They use these long arms to reach out for fruits growing on thin branches that would not usually support their weight and "brachiate" (swing from branch to branch by their arms). Chimps have opposable thumbs (although these are much shorter than human thumbs) and their opposable big toes enable a precision grip. Male Chimpanzees are slightly larger and heavier than females. At Gombe in East Africa, adult males weigh between 90 and 115 pounds and measure approximately 4 feet when standing upright. Females are slightly smaller. In contrast, Chimpanzees in West Africa, and in captivity, can be larger. In the wild, Chimpanzees rarely live longer than 50 years, although captive individuals can live for over 60 years. 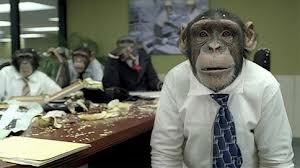 Chimpanzees culture is much like human culture: groups in different areas share different cultures. Tool-making is a good example of this variation. 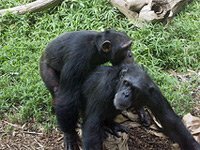 Chimpanzees in Gombe use long twigs and alter them for better termite fishing while chimpanzees of the Tai Forest in Cote d'Ivoire are more often seen nut-cracking with rocks and planed surfaces. Even chimpanzees living in separated areas in the same countries will exhibit different cultures and behaviours. But what kind of behaviors do most sub-species and groups of chimpanzees share? 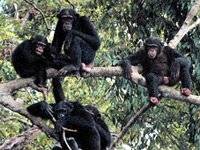 General behaviours like group structuring, communication, and hunting practices are often common from chimpanzee group to chimpanzee group, and even these factors are never constant! Posture, gesture, and facial expression communicate many messages and emotions within a Chimpanzee community. When greeting a dominant individual after an absence or in response to an aggressive gesture, nervous subordinates may approach with submissive signals - crouching, presenting the rump, holding the hand out - accompanied by pant-grunts or squeaks. In response, the dominant individual is likely to make gestures of reassurance, such as touching, kissing, or embracing the subordinate. Friendly physical contact is crucial in maintaining good relationships among chimpanzees. For this reason, social grooming is probably the most important social behavior, serving to sustain or improve friendships within the community and to calm nervous or tense individuals. The grin of fear seen in frightened chimpanzees may be similar to the nervous smile given by humans when tense or in stressful situations. When angry, chimpanzees may stand upright, swagger, wave their arms, throw branches or rocks - all with bristling hair and often while screaming or with lips bunched in ferocious scowls. Male chimpanzees proclaim their dominance with spectacular charging displays during which they slap their hands, stamp with their feet, drag branches as they run, or hurl rocks. In doing so, they make themselves look as big and dangerous as they possibly can, and indeed may eventually intimidate a higher-ranking individual without having to fight. Chimpanzees communicate using a wide variety of calls, postures and gestures. The food calls -- a mixture of grunts, barks, and pant hoots -- alert other chimpanzees to the location of a food source. A special excited intensity of these calls indicates that there has been a successful kill after a hunt. Each individual has his or her own distinctive pant-hoot, so that the caller can be identified. A loud, long, savage-sounding ‘wraaaa’ call is made when a chimpanzee comes across something unusual or dangerous. When young chimpanzees play, they emit breathy laughter. Soft grunts uttered by foraging or resting chimpanzees maintains communication within the group. 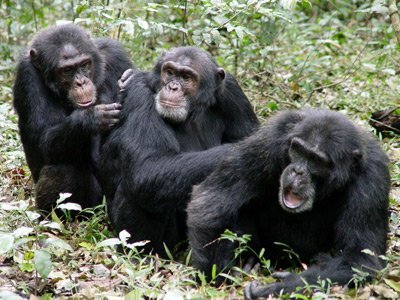 Chimpanzees live in social groups called communities or unit groups. At Gombe, there have been between 40 and 60 individuals in the main study community (Kasakela) since 1960. Communities may be larger in other areas, or may be reduced to very small remnant groups. Chimpanzees' social structure can be categorized as "fusion-fission", meaning they travel around in groups of up to six individuals. The organisational structure of these groups is constantly changing as individuals wander off on their own for period of time, or join other groups. At times, many of a community's members come together in large excited gatherings, usually when fruit is available in one part of the range, or when a sexually popular female comes into estrus. Mothers and dependent young up to the age of seven are always together. Some individuals travel together more often than others - such as siblings and pairs of male friends. Contact is maintained between members of scattered groups by means of the distance call: the pant hoot. Within the community, a male hierarchy establishes social standing, with one dominant male as the alpha. Females have their own, somewhat confused, hierarchy. All adult males dominate all females. Consequently most disputes within a community can be resolved by threats rather than actual attacks. However, the males within a community regularly patrol their boundaries, and if they encounter individuals of a neighboring community they may attack with extreme brutality. The only individuals who can move freely between communities are adolescent females who have not yet given birth. They may transfer to a new community permanently or, having become pregnant, move back to their own natal group. When a female is in estrus and sexually attractive and receptive to the males, the skin around her rump swells considerably and is clear pink. Females show their first very small sexual swellings at age eight or nine, but are not sexually attractive to the older males until they reach age 10 or 11. There is usually a two-year period of adolescent sterility before the female finally conceives. Spacing between births, provided the previous infant lives, is about five years. Some females in estrus are more attractive to the males than others. A popular female may be accompanied by many or even all of the adult males in her community. Alternatively the dominant male may become possessive of her and prevent the other males from attempted mating. Another interesting mating pattern is the consortship, during which a male persuades a female to accompany him to some peripheral part of the community range. If he is able to keep her there, away from other males until the time of ovulation, he has a good chance of siring her child. Even low-ranking males can become fathers if they have the skill to lead a female away at a time in her reproductive cycle when she is not interesting to the high-ranking males. At Gombe, chimpanzee males may be capable of reproduction at age 12 or 13, but are not socially mature until a few years later. Chimpanzees and humans differ by only 1.7% of DNA! Consequently, we have striking similarities in the blood composition and immune responses. In fact, biologically, chimpanzees are more closely related to humans than they are to gorillas! Some scientists have even proposed including chimpanzees in the same genus as human beings to recognize these similarities, calling them Homo troglodytes. The anatomy of the chimpanzee brain and central nervous system is startlingly similar to our own. Thus it should not surprise us that the chimpanzee (along with gorilla and bonobo) is capable of intellectual performances once thought unique to humans! In the wild, chimps must constantly make decisions, such as which group they should join or whether to be peaceful or aggressive. Moreover, they are capable of sophisticated cooperation in hunting. They use more tools for more purposes than any other creatures except ourselves. In captivity chimpanzees can be taught human languages such as American Sign Language (ASL), learning 300 or more signs and can master many complex skills on the computer. It has been demonstrated that chimpanzees are capable of reasoned thought, abstraction, generalisations, symbolic representation and have a concept of self. Although it is difficult to quantify emotions, those who have worked closely with chimpanzees agree that they feel and express emotions such as sadness and happiness, fear and despair - and they know mental as well as physical pain. 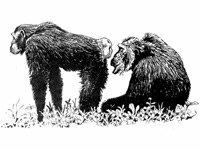 There are uncanny similarities in the nonverbal communication patterns of chimps and humans - kissing, embracing, patting on the back, touching hands, tickling, swaggering, shaking the first, brandishing sticks, hurling rocks. Chimps, like people, have a long childhood - five years of suckling and sleeping in their mothers' nests at night. After the birth of a new baby, an older child remains emotionally dependent on its mother and continues to travel with her for the next three to four years. Bonds formed between mother and offspring and between siblings during this intense association period are likely to persist throughout life. This long childhood is as important for the chimp as for the human child. 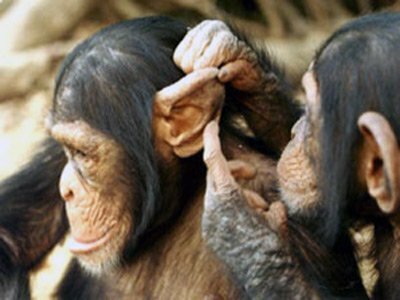 Due to the chimp's fascination with the behavior of others and ability to imitate and practice observed actions, behavioural patterns are passed down from one generation to the next. When a mother dies her orphaned offspring may be unable to survive. The orphan shows signs of clinical depression, and feeding and play activities decline. Older siblings, including males, often adopt their orphaned brothers or sisters. Occasionally individuals adopt infants not related to them - suggesting altruistic behaviour. The biological composition of chimpanzees is so similar to our own that they can catch or be infected with all known human infectious diseases (with the possible exception of cholera). This is why they are used in medical research. Increasingly, researchers are finding that the similarities in behaviour, intellectual performance and emotions are equally as striking. This will hopefully lead to improved medical research lab conditions. Ultimately, we hope it will no longer be considered ethical to use them at all. Jane Goodall's study of chimpanzees not only points to striking similarities between humans and chimpanzees but to the differences. Perhaps the most significant of these is the fact that chimpanzees have not developed spoken language. Humans can teach their infants about things or events not present, share knowledge of the distant past, make plans for the distant future, discuss an idea so that it grows as a result of the accumulated wisdom of the group. 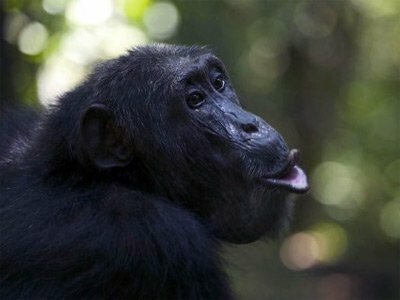 The fact that chimpanzees can learn from humans, to communicate using human languages such as ASL or computers does not minimise this difference. It is our language that has enabled our species to become so dependent on culturally transmitted behaviour. Our intellect dwarfs that of even the most gifted chimpanzee. There are, of course, very many physical differences as well. One is in the structure of the vocal tract, as mentioned. Chimpanzees have not developed the upright posture of humans. The anatomy of our hands and feet is also very different. JGIA is opposed to using chimpanzees in advertising and entertainment for welfare and conservation reasons and for the dignity of the species. Although performing chimpanzees may appear to happy, the truth about their welfare is often very sad. Chimpanzees are strikingly similar to humans and we share almost 99% of the same DNA. Our behaviours and emotions are very similar. Like us, chimpanzees are sentient animals,which means, they have the capacity to experience pleasure and pain. Trainers frequently use fear and physical discipline to control their apes and the degree of force increases as the apes grow. This continues until around eight years of age when they become to strong and dangerous to handle. When their careers are over, the lucky ones end up in sanctuaries. Others end up in poor conditions in roadside zoos or are used as breeders to continue the cycle, spending the next 50 years in a cage. There is no humane or sustainable retirement plan. The use of chimpanzees and other great apes in advertising and entertainment creates misleading and degrading perceptions of these magnificent animals, who are seriously endangered in the wild. How are chimpanzees trained to perform? They are separated from their mothers as infants. This is truly tragic, because in the wild, the child stays with his or her family for at least eight years. Furthermore — trainers require obedient subjects. Although it is possible to train animals using only kindness, reward and praise, this requires the kind of time and patience which simply are lacking in the fast-moving world of show-business. Many trainers will admit that they beat their performers during training. In many cases the abuse is horrendous. What happens to the performers after they reach puberty? When they are six to eight years old, they typically become more difficult to handle. To make them manageable, trainers may have the chimps' teeth pulled or may fit them with shock collars under their clothes. But usually the performers, when they are no longer amenable to discipline, are discarded. And it is becoming harder and harder to place them. Like human children, ape children learn by watching adults and imitating their behaviour. They learn in a social context. And individuals who have no chance to grow up in a normal group not only fail to learn the nuances of chimp etiquette, but in addition are likely to show abnormal behaviours. These chimps are not accepted by accredited zoos. They tend not to fit into established groups. And so, unless they can be placed in one of the few sanctuaries for abused, surplus chimps, they will end up in roadside zoos or being quietly euthanised. "The structure of the chimpanzee brain is startlingly similar to that of the human."